Did you know that it only costs $6,500 to build a well that will support 4,000+ people. 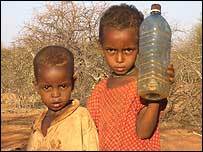 Right now the worst drought is in the Horn of Africa. These people are starving because everything they depend on comes down to the need for water. So please take a moment of your time and a few of your dollars to build this well. God will bless you for helping his people.